Night – MonSter under my bed – . 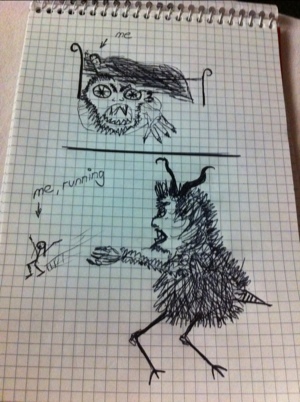 Insomnia is the adult version of monsters under the bed – I am dealing with both at the moment. I am wide awake since 2 AM, darkness and silence ask for negative thoughts and worries. But my main trouble is the monster under my bed. It’s there, I can feel its presence, I can hear rumbling, smell its horrible odor. I don’t dare to move as it can get me whenever it wants and leave me paralyzed. A scary thought that makes me speechless, but I want to scream for help in the dark. Maybe, maybe it won’t notice me…not tonight.